This was our second and last day of bus shlepping - and we are both pretty glad. It is not enough time to really see each place, so it's a little bit of a tease ... Maybe because they want us to come back to live and then see some more in our free time. Today, we drove up into the crazy forests and hills of the Galil, the area just west of the Yam Kinneret (it's sometimes called the Sea of Galilee on maps, but nobody actually calls it that). After we drove for a while, we came around the corner and there, in a valley, looking very tiny compared to Lake Ontario, was the Kinneret. Everybody here is very excited because it's almost FULL - Israel doesn't get much water in the summer, so the rain that falls in the winter has to last all year. 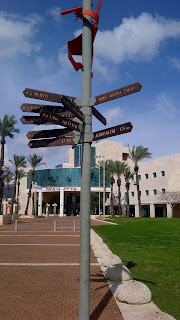 Our first stop was a city called Karmiel, which means Hashem's vineyard. There are lots of grapes growing all around, and olive trees and many other green, growing things. We got a tour of the city and stopped at City Hall to meet the mayor. He invited us all onto his office's porch to look out over a big park in the centre of town. Karmiel has many Russian-speaking people, who came here straight from Russia when they were finally allowed to leave after many years. It is an organized, clean city, though we couldn't find a nice coffee shop during our lunch break there. They have plenty of stores and malls, though, and we did buy some iced coffee in a grocery store near City Hall. Then, after "lunch," we were back in the bus for our trip to Tzefat. It's a very holy city where lots of famous rabbis lived. 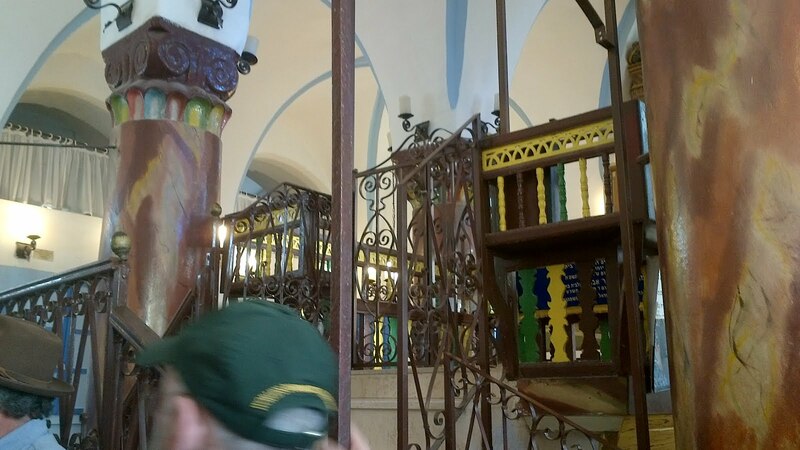 Abba got to daven mincha in the shul of the Ari - well ,outside the shul, because there were tourists inside and it wasn't exactly mincha time, so they just grabbed 10 people and davened. 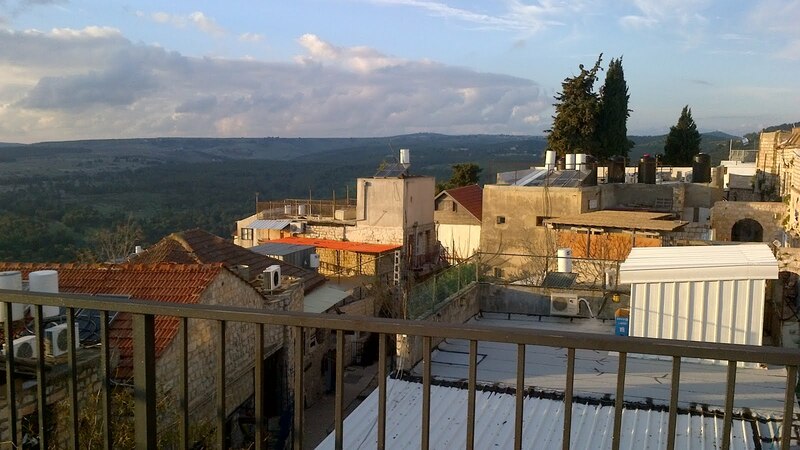 The Old City of Tzefat is a strange place with narrow stone roads and art galleries. I climbed to a deck on top of one of the galleries and took this picture looking out over the mountains and hills nearby. The best thing in Tzefat - well, best for me, because Abba loved the whole city - was meeting up with Mrs. Z (a friend from shul in Toronto). The organizers invited some new olim to come talk at a youth centre ("youth" is defined as aged 18 to 45, but we were told they never turn away any "youth" even if they're a bit older), and they asked her to stand up and talk about their lives here. 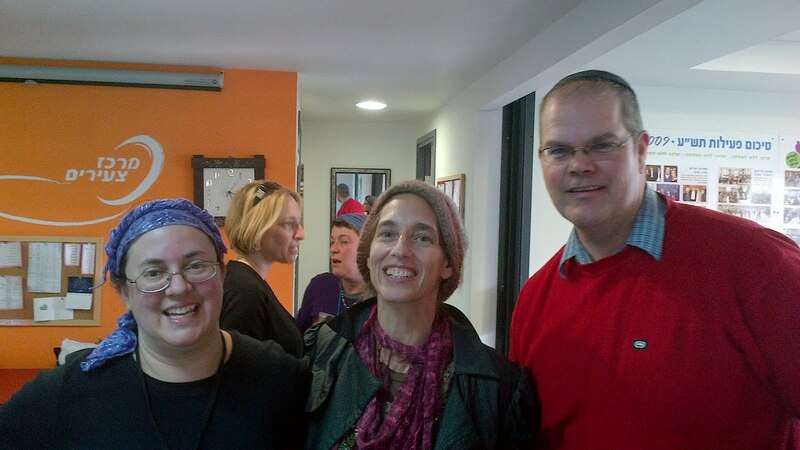 She explained about how Hashem helped them find jobs and good schools for their kids. They're apparently having a very good time, but we didn't see the kids, and Mr. Z was away at a wedding in Yerushalayim, so we couldn't meet up with him. Tzefat took a long time, so after that we took a new shortcut road back to Nahariya, and it only took about 45 minutes. Things look far on maps, but this is a tiny country, and nobody is too far away. This is going to be my last email. We have lots of work tomorrow, like classes about schools and work and also meetings with the organizers so they can see if any of the cities we like would be a good home for our family, and talk more about the good things and bad things about living up here at the top of the country (some things are a bit more expensive and in some areas you need a car, but on the other hand, it is cooler and greener in the north than anywhere else in Israel). We are finishing our meetings by 4pm tomorrow, then packing into a taxi to take the train south to the airport. There's no more kosher McDonald's at the airport, but they have a few kosher restaurants there, I think, so hopefully we'll get there early enough to get some food while we wait for the plane... to come home. We will be home very soon now, and I am so excited to see you all!!! I wish you could see how excited every single person is that Purim is coming. It is a very busy, happy holiday here. Practically every bakery has hamentaschen (oznay haman) year-round, but more now than ever. Last night, we bought ones that were chocolate hamentaschen with halva filling. Yummy! Tonight, it is late and we are very, very tired.